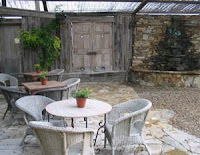 It looks rustic on the outside, but the inside of Adobe Rose Inn is very genteel. Light, airy rooms are furnished with antique furniture, and the upstairs sitting room invites folks to sit, read, or just enjoy conversation. Floral print chairs on the porch provide ample seating for relaxing and escaping pressures of every day life—the reason most guests come to tiny Marathon (population 800) in far west Texas. It’s a serene setting, repeated on the upstairs veranda, the ideal place to view town happenings and gorgeous purple sunsets over the Chisos Mountains. That’s just the ambience Houston transplant Lisa Branum tried to create when she purchased an adobe home built over 120 years ago by one of Marathon’s early merchants and occupied by his family for 92 years. Restoration began when Branum bought the home in 1998, and now three gracious upstairs rooms with balcony access, an additional suite that opens onto a courtyard, and a detached space with dual beds provide accommodations for guests. Each guest room has a private bath, ceiling fans and air conditioners, and high-speed wireless Internet access. Recognizing that a visit to Marathon usually requires a long drive, the owners offer guests a five-minute shoulder massage for only $5.00. A highlight is the walled garden courtyard framed by massive doors from an Irish prison. Soothing water sounds flow from the fountain, designed with green glass found in the Big Bend region. Guests may lounge in the secluded hot tub under a clear, star-filled Western sky. Shaded seating and a koi pond create a favorite retreat where peacefulness is guaranteed. 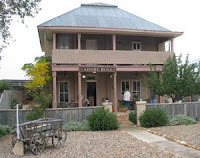 Branum’s daughter Carrie and her husband Mark Hannan, a British transport, took over management of the B and B. Hannan at first seems oddly out of place in the remote desert surroundings, but he obviously relishes host duties and takes pride in the inn. He directs guests to local art galleries and sends them down the road to Big Bend National Park and an adventurous day of hiking, canoeing, or birding. The McDonald Observatory at Fort Davis is another popular day trip. Adobe Rose, a member of Historic and Hospitality Accommodations of Texas, combines the best of historical memories and pleasant modern surroundings. Rates range from $120 to $135 per night.